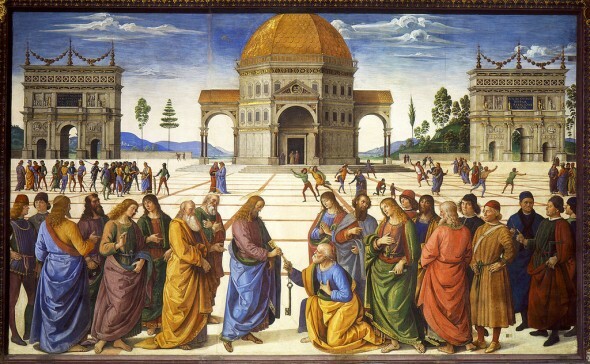 Perhaps the most famous painting in the Sistine Chapel before Michelangelo’s time was one by fresco by Pietro Perugino called “Christ Handing the Keys of the Kingdom to Saint Peter”. Perugino carried on what Masaccio and others had been doing before, but he was able to place his painted forms in depicted space in a new and convincing way. Perugino began his work after he was commissioned by Pope Sixtus IV (reigned 1471-1484) to paint part of a cycle of frescoes for the Sistine Chapel in Rome. The end result was a quintessential example of Early Renaissance painting that reduced the “flatness” of the two-dimensional surface and created a believable appearance of a scene in three dimensions. As far as the composition is concerned, the most striking element is line, through which Perugino almost left us with a textbook case study of one-point linear perspective. While the series of horizontal lines divide foreground from background, the diagonal orthogonal lines create the appearance of depth as they converge at the vanishing point near the doorway of the building in the background. The result is that the scene takes place on what appears to be a large grid which allows viewers to quite clearly ascertain the distance between figures in the foreground, middle ground, and background. 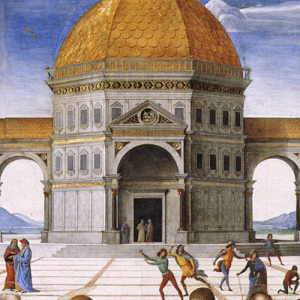 In addition, Perugino used aerial perspective to make the hills on either side of the temple appear to fade into the background. Both types of perspective help the viewer understand visually that the scene is anchored realistically in three dimensions, even though it was obviously painted on a two-dimensional picture plane. This particular story underscores the message of Petrine authority, so it is not surprising that Sixtus would want this scene to be painted in one of the important buildings of the Vatican. In the fresco, Christ is shown in the middle, literally giving St. Peter keys (alluding to the “keys to the kingdom of heaven”), while the apostles stand in groups behind them. Also around them are figures in contemporary dress, who seem to witness the momentous event. Quite clearly, the handing of the keys to Peter is meant to frame the Catholic doctrine of apostolic succession by which Christ handed power to Peter, and hence onto the popes. Christ and Peter are the figures of prime importance in this scene, and the importance of spiritual authority (embodied in the keys) is particularly emphasized by the key which hangs down vertically along the axis where the vanishing point is located. The setting is a piazza, which is very spacious and airy. It is not a piazza from real life, but instead an idealized one with a temple in the middle of it. Aided by the grid-like ground pattern, we see separate groups of figures in the middle ground on both left and right sides of the piazza. These are scenes from episodes of the Gospels – one in which Christ says “render unto Caesar”, and the other in which the crowd is getting ready to stone Christ before he escapes. The looming structures in the background are particularly notable. The temple is centrally-planned and domed, presumably with eight sides. For pilgrims visiting the Holy Land, the Temple of Solomon was thought to be associated with the Dome of the Rock in Jerusalem, and so what we are seeing here is based on a similarly octagonal and domed form. On either side of the temple, monumental arches stand decorated with reliefs and gilded surfaces. These are triumphal arches of the kind built by the ancient Romans. These particular arches, however, resemble one very specific arch built in Rome around 312 A.D. – the Arch of Constantine, who reigned as emperor from 306-337 A.D. Constantine was the first emperor to legalize the profession of the Christian faith in the empire after centuries of Christian persecution by pagan emperors, and he was also the patron of the greatest churches of the late antique period. One of these churches was the (Old) Basilica of St. Peter, which became the seat of the pope in Rome. It was also thought that Constantine was the first to officially recognize papal authority. Again, this underscores the idea of papal authority. 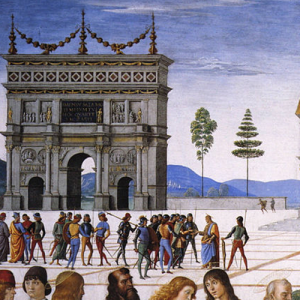 Overall, the scene is one showing a critical Biblical episode for the popes, and one which makes excellent use of Renaissance perspectival devices to create the illusion of depth on a two-dimensional surface. It would likely be the most important fresco inside the chapel if not for another series of frescos painted some three decades later by a painter who would produce one of the greatest masterpieces in the history of art – Michelangelo, and his Sistine Chapel ceiling cycle. ItalianRenaissance.org, "Perugino’s Christ Handing the Keys to Saint Peter," in ItalianRenaissance.org, July 19, 2012, http://www.italianrenaissance.org/perugino-christ-handing-keys-peter/.